Jackson Heights Apartments is a 3 story non-smoking apartment complex with a total of 41 units. 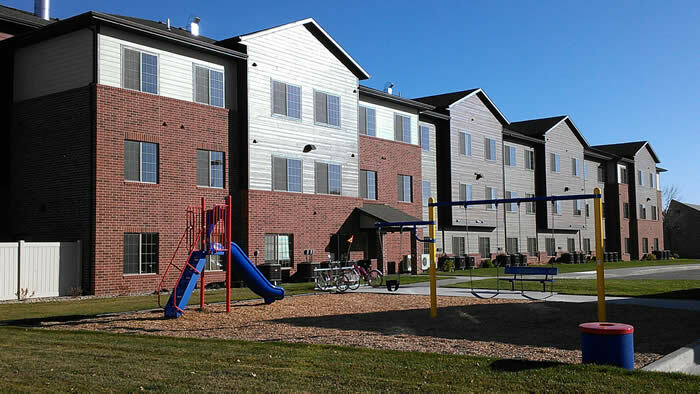 There are 19 – 1 bedroom, 15 – 2 bedroom and 7 – 3 bedroom units available with 8 handicap accessible units on the 1st floor. Sizes range from 671 to 1,233 square feet. There are 29 garages available for an additional fee per month. Each apartment is furnished with a range, refrigerator, microwave, dishwasher, washer & dryer, central air conditioning, forced air heating, mini-blinds, carpet, interior storage closets, and cable TV & high speed internet hookups. All utilities are included. On-site amenities include a playground, trash chute, elevator and a foyer with security.